If your lawn has grass in some areas but looks pretty thin in others, you may want to consider over seeding your lawn. Grass that’s been damaged by a drought – a lack of rain in the spring, followed by a hot summer – often results in thinning areas, or a lawn that appears patchy in spots. By over seeding your lawn you can return your grass to its original full, green luster. 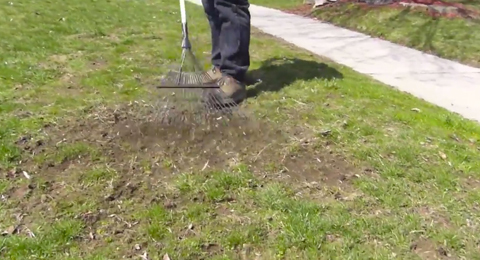 Read on to learn how you can over seed your lawn in 7 simple steps. You may just end up with the best looking grass in the neighborhood! Before your begin to over seed your lawn, it’s important that you have the right tools for the task. Luckily, you probably already have everything you need on your garage. If not, these things can be found easily in your local hardware store. 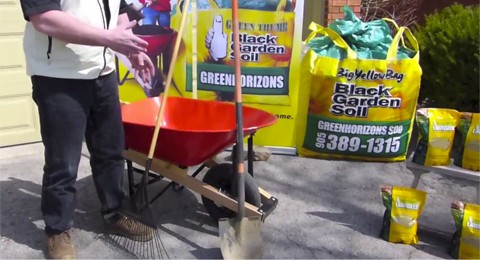 Here’s what you need to begin: a leaf rake, a wheelbarrow, a shovel, a bag of lawn seed, and a bag of black garden soil. 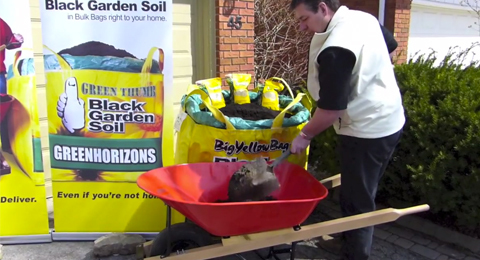 With your tools at the ready, it’s time to start shoveling the garden soil into your wheelbarrow. You want to achieve a forty to one ratio of garden soil to lawn seed. That’s about forty shovels-full of garden soil to one shovel of lawn seed. Or, if that’s a little more than your wheelbarrow can handle, start with twenty shovels-full of garden soil to half a shovel of lawn seed. It’s important to mix your garden soil and lawn seed thoroughly and evenly to help ensure that your lawn seed retains moisture. To really get a good mix, we’d suggest making a groove in your garden soil in the wheelbarrow, and pouring your grass seed in. Then mix it up until it’s equally distributed throughout the soil. 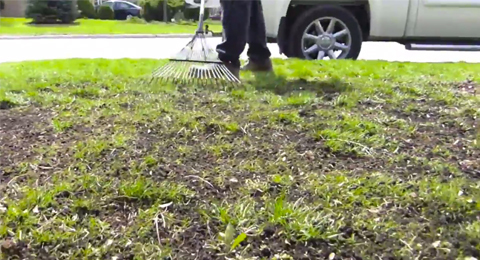 Before you put your soil-seed blend onto your grass, you’re going to want to grab your rake and use it to remove any debris or organic matter from the area that you’d like to over seed. 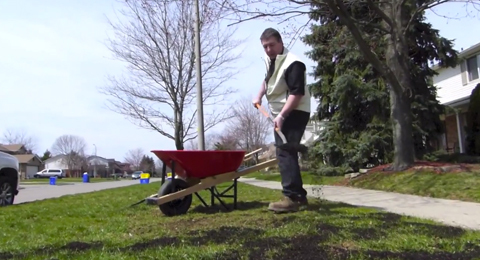 This helps to ensure good seed to soil contact – and a fuller, more beautiful lawn! With a clean working area and a uniform mixture of garden soil and lawn seed, you’re ready to start the process of over seeding. Start in one corner of your lawn, and systematically begin to uniformly spread the mixture from one side to the other using your shovel. 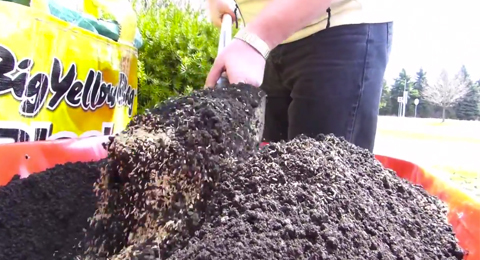 Try and distribute your garden soil and lawn seed combination as evenly as possible. With the mixture on your lawn, it’s time to get the rake out again to really ensure that you’ve got the garden soil and lawn seed distributed as evenly as possible across your grass. Work from one side to the other, this time finishing by making rows with your rake just as you would in a garden. This step helps to promote good seed to soil contact, which is vital for successful over seeding. With the over seeding complete, you’ll just need to ensure that your lawn stays consistently moist for approximately 10 – 14 days. 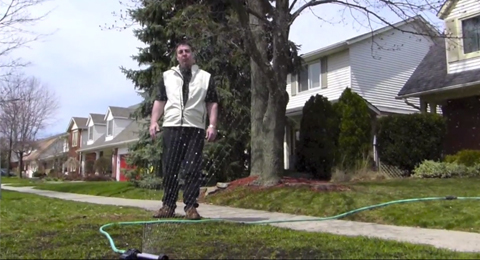 That doesn’t mean that you need to leave your sprinkler on for hours. Simply turning it on for 5-10 minutes in the morning before you leave for work, or in the evening after you get home should be all you need to achieve a fuller, greener lawn! Over seeding your lawn is an easy way for you to get rid of patchy spots, and restore your grass to its original fullness. Follow these simple steps to over seed your lawn and get your property looking its best this spring.